WASHINGTON, DC—President Trump’s daily brief is now being supplied by Hanes, according to Counter Terrorism Adviser Thomas Bossert. 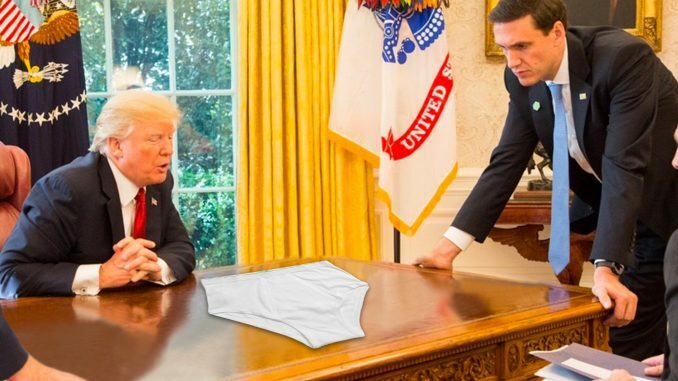 Trump was reportedly attracted to the XXL Hanes brief, specifically for it’s tagless design which he thought might limit his legal exposure to a congressional subpoena should a democratic majority take over following the November elections. Briefs are highly secured and are considered ‘for presidential eyes only’ by security services, except for one instance where the President decided to ask Omarosa Manigault for her opinion of his brief. Bossert would not describe Manigault’s reaction to this question. Manigault was removed from her position shortly thereafter. Once the President has finished with a brief, it is placed in a special burn bag and taken to a secured furnace where it is exposed to long blast of ignited propane until nothing but embers remains. “All the staff in the White House are extremely nervous and uncomfortable until the brief is destroyed”, said Bossert. According to Bossert, the President had fired previous supplier Fruit of the Loom due to a leak that had resulted in an unpleasant smear campaign.